USD/CNY is currently trading around 6.8928 marks. It made intraday high at 6.9153 and low at 6.8924 levels. A sustained close above 6.9075 marks will test key resistances at 6.9210, 6.9396, 6.9525 and 6.9620 marks respectively. Alternatively, a daily close below 6.9075 will drag the parity down towards key supports at 6.8886, 6.8525, 6.8348, 6.8210, 6.8095, 6.8020 and 6.7864 marks respectively. PBOC sets yuan mid-point at 6.8996 / dlr vs last close 6.9099. 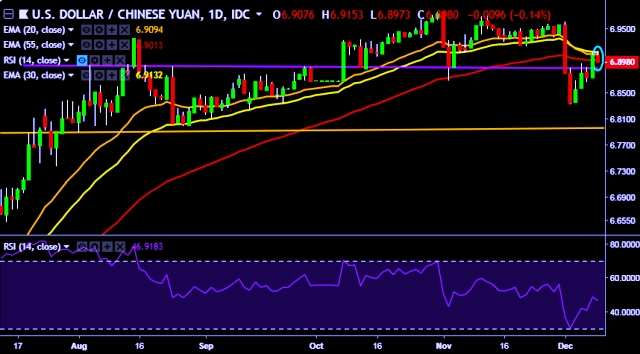 We prefer to take long position on USD/CNY around 6.89, stop loss at 6.88 and target of 6.9210.